A study reported in the Journal of the American Medical Association examined unintentional pediatric exposure to marijuana in Colorado both before and after its recreational use was made legal in that state. The study found that unintentional exposure cases increased more than five times between 2009 (before legalization, in which only 9 children were exposed) and 2015 (after legalization, in which 47 children were exposed). While these cases were only reported from one hospital facility in Aurora, Colorado, the entire state saw a greater increase in unintentional exposure cases than the rest of the country. Baked goods, popcorn, and candy products were involved in more than half of these accidental ingestions. California has also seen its share of accidental marijuana ingestion by children. 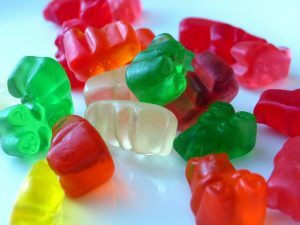 KTVU reports that middle school students in San Diego became ill in April 2017 after a classmate sold them marijuana-infused gummy bears. And in August 2017, nineteen people became ill at a Quincenera party after eating edible pot candies. This anecdotal evidence is not nearly as persuasive as the statistical evidence, which suggests that California – like Colorado – will see an increase in accidental ingestion of marijuana by children once recreational marijuana sales are made legal. According to KTVU, Assembly Bill 350 would prohibit sales of edible cannabis products in the shape of a person, animal, insect or fruit. The Bill passed final legislative approval on September 14th, 2017, and has been sent to the Governor for consideration. Colorado enacted a similar law which taxes effect on October 1, 2017. The Cannabis Industry Journal reports that the law prohibits sales of edibles in the shape of an animal, human or fruit within the State of Colorado. If it passes, the law could lead to minute regulations for cannabis preparers. There will fine distinctions between those edible products which look to much like candy and those which do not. And yet – regardless of whether the bill is signed into law by Governor Brown or not – it raises important questions about child safety around recreational marijuana. Cannabis business owners – whether cultivators, distributors, or retailers – could face liability for accidental ingestion of products which are appealing to children. While appropriate packing can help this problem, the exposure cannot be removed altogether. This is an area in which business owners are wise to consult with a cannabis attorney about their packing, branding, and products. An experienced Orange County cannabis copyright and trademark lawyer can help recreational and medical marijuana businesses ensure they are in compliance with this new and developing area of the law. Sound legal advice can also limit business owners’ exposure to legal liability for accidental ingestion of their cannabis products by children.